Mid-size pickups are making a strong comeback, and the familiar faces of the Nissan Frontier and Toyota Tacoma continue to play a major role in this truck segment. If you're shopping for a mid-size pickup, then the 2019 Nissan Frontier offers a unique package of capability, dependability and value. With its low starting MSRP and well-equipped trim levels, this new Frontier is a legitimate alternative to costlier models like the 2019 Toyota Tacoma. Performance Nissan invites drivers from nearby Fort Lauderdale, Florida to shop and explore the new Nissan Frontier pickups for sale at our dealership in Pompano Beach, FL. Here on our website you can compare the Frontier to its rival from Toyota, and also begin shopping our selection of new Nissan vehicles for sale before your visit for an informative tour from our sales staff. You may have thought that affordable new pickup trucks were a thing of the past, but that's not so when you shop the 2019 Nissan Frontier. With a starting MSRP well below $20,000, the 2019 Frontier delivers exceptional value for your money -- especially when you consider its list of standard features! A comparable 2019 Toyota Tacoma starts from thousands of dollars more than the Nissan and offers similar performance and features but at an elevated price. Drivers who decide to cross-shop the V6-equipped editions of the 2019 Nissan Frontier and Toyota Tacoma will find a similar story when it comes to price; the Nissan's MSRP is significantly lower across the entire model range. With that lower price comes the available 4.0-liter V6 engine that develops greater torque than the smaller 3.5-liter V6 offered in the Tacoma. For power and value in the mid-size truck segment, be sure to test drive a 2019 Nissan Frontier! Even with its drastically lower starting MSRP, the 2019 Frontier packs quite an extensive list of standard features when compared to its rival from Toyota. Features like the Frontier's 50-50 folding rear seats and illuminated glove box aren't available on the Tacoma SR base model that costs thousands more. There's even a cargo box light in the bed of the 2019 Frontier S, something not offered on the Tacoma SR. When it comes to all-around performance, Nissan equips every 2019 Frontier to be a highly capable performer, thanks to its standard 4-cylinder engine and 4-wheel disc brakes. The Tacoma also comes standard with a capable 4-cylinder engine but gets disc brakes only on the front wheels; drum brakes are fitted to the Tacoma SR models. Boca Raton, FL area drivers can take a closer look at the entire lineup of 2019 Nissan Frontier pickups available at Performance Nissan. 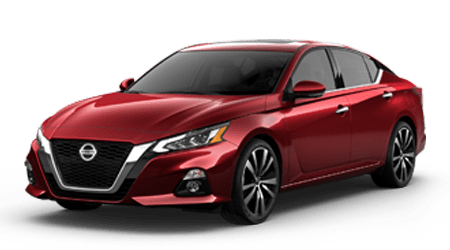 Here, you'll find an extensive selection of new Nissan vehicles for sale along with financing staff, a convenient online auto loan application, dedicated service center and more. We're here for you with continued service, so we welcome you to contact our team or stop by soon!